Using a small saucepan heat the blueberries and reduce for a couple minutes until thick. 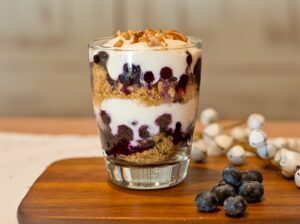 Take a glass (approximately 270ml) and start to layer your trifle, starting with 1⁄2 crushed Weet-Bix followed by 1⁄2 the yogurt, then the blueberry mix and pecans. Repeat once again. Sit for a few minutes to allow the Weet-Bix to soften before eating. Recipe kindly provided by Sanitarium – for more recipes visit their website here.